Prepping and degreasing metal surfaces prior to welding makes for a better weld. Solvents and solvent alternatives are used to clean surfaces in preparation for welding, painting, or re-lubrication. 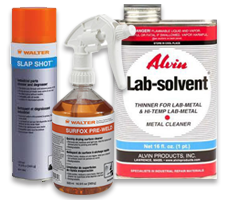 Shop Weldfabulous for cleaning solvents and pre-weld cleaner products by top brands like Walter and Bessey.